Finding an air conditioning system tailor-made to individual needs can be a difficult task. Numerous options and technologies exist and can be overwhelming without a qualified guide to help navigate the selection process. Platinum Air Heating & Cooling can help simplify the entire air conditioning installation process with the assistance of our professional and highly experienced team. Platinum Air Heating & Cooling has two full-time dedicated estimators for air conditioning installation. Tucson residents and business owners can benefit from the time the estimators will spend verifying what is desired and then generate a personalized estimate for exactly those needs. And, the estimate is always free for new installations! 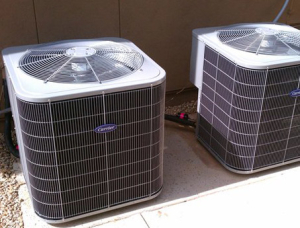 Our goal is to make the installation of all new air conditioning systems as seamless and worry free as possible. When choosing an air conditioning installation, Tucson has the expert services of Platinum Air Heating & Cooling a phone call away. Once the personalized estimate is provided and approved, our experienced installers will take the time to make certain that the installation is clean, efficient and meets the highest industry standards. We will also guarantee that the system is operating at optimal efficiency before completion of the job. We’re the Tucson air conditioning installation specialists, and we aim for 100 % satisfaction every time! At Platinum Air Heating & Cooling, we deliver professional services for all residential and commercial heating and cooling needs. After all, making the environment comfortable is our number one objective. We provide air conditioning installation Tucson style friendly, reliable, knowledgeable, and always with the most affordable rates in mind. Every job focuses on specific customer needs, and we’ll ensure satisfaction with all new air conditioning systems. After all, we stand behind our work and want lifelong family, not just customers! If you’d like more information about how to save money on your AC repair, Tucson utility bills or overall cooling costs by upgrading to an energy efficient air conditioning unit, please contact us. Or, if you are in need of an air conditioning repair, Tucson residents please call 520-867-9861 to schedule an appointment.